A Holocaust survivor's story, how she came to tell it, and how we've been documenting it. Welcome to the UCSB Holocaust Oral History Project web site. This site's objective is to provide resources for conducting oral history research about the Nazi genocide and how it has been understood and remembered since World War II. It began in 1999 as a web site about Nina Morecki, a Holocaust survivor who begann speaking to local school classes in 1993. Holocaust in the Ukraine, how Nina came to tell her story, and how we have worked to document it and present it to you. If you have questions, please contact marcuse@history.ucsb.edu. March 2016: Many mass graves still being uncovered in Ukraine (NYT article, May 13, 2015), focus on Lviv region. Aug. 2015: "Ukraine Unveils Monuments To Recognize Jews Killed In Holocaust: The monuments sit atop mass graves," in HuffPost, July 16, 2015. This is not about Lviv/Janowska, where Nina lived and was imprisoned, but about the surrounding region, into which she escaped from the pit of executed prisoner corpses. August 2013: See this new book publication about the effects of listening to survivor testimony: Thomas Trezise, Witnessing Witnessing: On the Reception of Holocaust Survivor Testimony (Fordham University Press, 2013), 336 pages. ($21 at amazon). 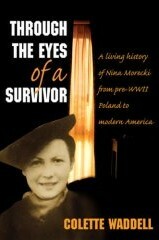 March 2012: Nina Morecki passed away this month at age 91. We remember her fondly. The Diamond Bar synagogue paid special tribute to her (memorial event announcement [link expired 8/2013; avail. 8/2015]). Alan Rosen, The Wonder of Their Voices The 1946 Holocaust Interviews of David Boder (Oxford UP, 2012), 336 pages. Guidelines for conducting interviews by Mario Perez, on this site. Jan. 30, 2011: At long last!! I've typed up and added the remaining 30 handwritten pages of my journal of the trip to Lviv with Nina and her daughter in August 1999. Jan. 2011: Jeremy Garsha, who made some of the most valuable contributions to this project back in 2004, just published an article. See the link on the Oral History Resources page. The Stories Matter project of Concordia College has a software application that allows archiving of audio and video as an alternative to transcription. Oct. 2007: "A Priest Methodically Reveals Ukrainian Jews’ Fate," New York Times Saturday profile, Oct. 6, 2007. 52-year-old priest Patrick Desbois travels to villages in the Ukraine and asks about what residents witnessed as teens. He has collected over 700 videotaped interviews and located 600 mass graves. Some of the artifacts and videotapes are now on exhibit in Paris. July 2004 article about Alexander Schwarz, a Lvov survivor who created the memorial at the Janovska "Valley of Death" and who supports the Lvov Jewish community. Nov 2004 article about a book (in German) containing interviews with 86 Jewish survivors from the Ukraine. Description of classroom visit, May 2002. Trip to Lvov in 1999: pictures, journal. Transcripts of interviews with Nina. (some answers are available in quicktime video format). Reviews of books about Lvov & oral history. 1921 Nina is born in Lvov Poland. Her father manages a family lumber mill; her mother inherits a soap factory. 1928 Lumber mill burned in a fire. 1931-34 Nina attends Gymnasium (high school). 1935 Nina is accepted to the University (Hebrew) Med. School, didn't go because the war broke out. 1939 September. Soviets and Germans invade Poland. First the Germans, then the Soviets occupy Lvov. Nina works with nuns as a nurse, Russian nurses and doctors come in and remove Nina (she was not a certified nurse). 1941 July. Germans invade the Soviet Union (and Lvov). The Soviets flee Lvov, but Nina's family decides not to leave. 1942 - Relocation of Jews -Lived in Newly abandoned quarters of non-Jewish Poles who had lived in poverty but were moved to a better part of the city. Timeframe is a little unclear in 1942 and 1943 (events blended together in memory). 1996 - Nina tells her story at UCSB; a friend helps her to rewrite the Carpinteria High text.